Jordan Kivelstadt decided to ditch glass wine bottles after he literally kicked a keg. Kivelstadt was working on a bottling line in California and one day in 2008, things didn't go well. Bottling is a precise process, one wrong move and production can come to a shattering halt. "I had a bad bottling day and I sulked back into the winery and kicked the keg we stored some of the wine in. Then I realized: why can't I sell wine in this?" So he did. And he's not the only one getting innovative: Glass bottles are facing increased competition on wine shelves. 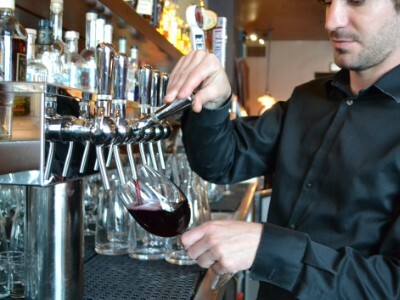 Kivelstadt launched Free Flow Wines in 2009 as a wine-in-a-keg producer and the company has since begun working with more than 200 brands to put their products in kegs to distribute to restaurants. He said there are more than 80,000 of his kegs floating around the country and that the majority of the wines sell for $8-$15 a glass, with a couple climbing to $20. The argument for keeping wine in a glass bottle is that it helps a wine age properly. However, according to Kevin Zraly, founder of the Windows on the World Wine School, 90% of wine is meant to be consumed within one year. "That means any of those can be put out in vessels outside the glass bottle and still be good wine." Many of the bottle replacements are more cost effective because they reduce shipping and operational costs for winemakers. But these alternatives aren't your grandmother's boxed wine. "It's quality...it's not that sweet, sickly, manufactured wine that we saw our grandparents drink," said Gwendolyn Osborn, director of education at Wine.com. "You can find quality red blends that aren't going to give you a headache within five minutes." "The structural presentation of wine is changing, that's for sure," said Andrew Streeter, a specialist in consumer packaging. 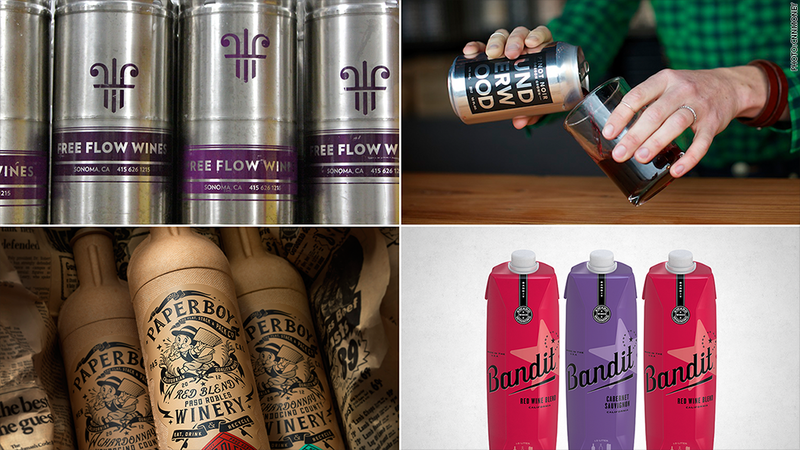 He pointed to aluminum cans, pouches, paper bottles, plastic bag-lined boxes and polyethylene terephthalate (PET) bottles as leading contenders for disrupting wine packaging. Streeter expects wine to become so portable in 10 years that it will be "much more like [carrying] a stick of gum." Bandit wines, which come in Tetra Pak cartons made mainly from paper and come in 1 liter and 500mL sizes, have been around since 2004 and according to Bob Torkelson, president of Trinchero Family Estates, the brand sells a quarter of a million cases per year. 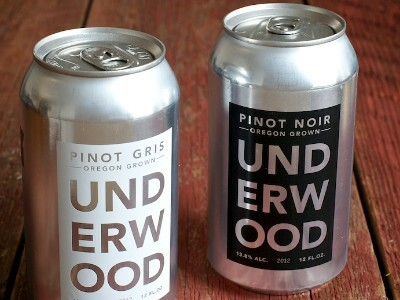 The Union Wine Co. in Oregon offers 375-mL cans with pinot noir and pinot gris. It's the same wine packaged into the company's bottles, and the suggested retail price is $6 a can or $24 for a four pack. There are around two glasses of wine per can, and the company asks that you "keep your pinkie down" when drinking it. Demand for more eco-friendly options has also spurred new bottles to hit wine shelves. Sonoma County-Calif. based Truett-Hurst launched Paperboy and California Square last year. 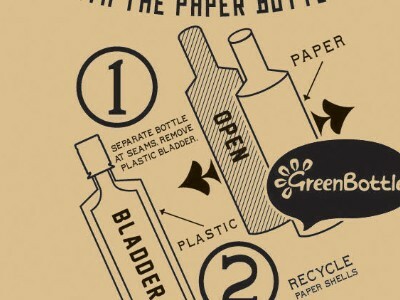 Paperboy's bottle is made from recycled cardboard with a plastic liner and is 85% lighter than a glass bottle, according to its winemaker Virginia Lambirx. It retails for around $12-$14 a bottle. Despite being described as "good- quality wine" by Lambirx she said, "it's not going to appeal to the super wine snobs [because] it doesn't have a cork closure or come in a glass bottle." Knowing this, the company also introduced California Square, which has the shape of a typical olive oil bottle. It's still made out of glass, but Lambirx said the square shape uses less material to store and ship. The line features a Russian River Valley Chardonnay, Paso Robles Three Red Blend and Paso Robles Cabernet. When it comes to innovation, Kivelstadt said the wine industry is its own worst enemy. After all, it took nearly 10 years for the industry to accept a screw top. But Zraly said consumers also have to play a role to embracing innovation. "It's time to take wine off its pedestal; that wine is sacred liquid that can only be consumed by few and involve a big production."